Are you a big fan and believer of the cliche' hitting two birds with one stone? Well, I just had this phenomena happened to me while I was in Florida a few weeks ago. I was there for the uber-exciting She Streams conference in Fort Lauderdale and also was on assignment as the upcoming guest blogger and travel writer for Visit Kissimmee! What a delight to be able to do two things at the same time. It was on it's own a one heck of an adventure for me. It was hard work though but it was also an experience worth remembering. 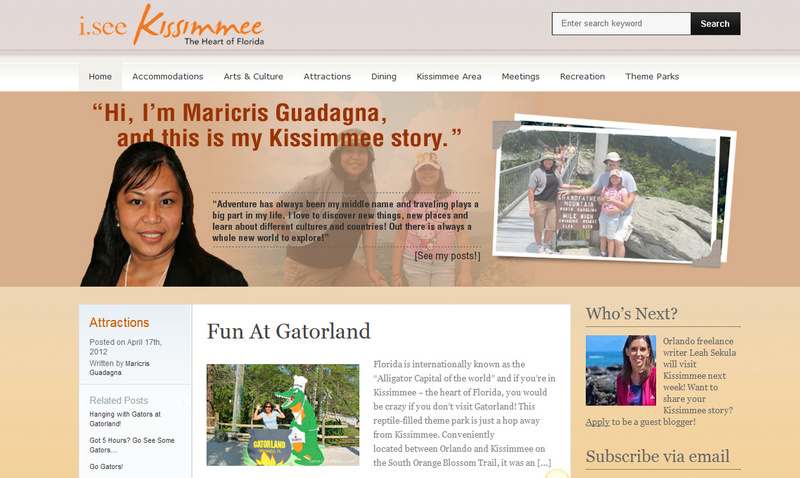 To be able to write and be featured at Kissimmee Convention and Visitors Bureau official blog as well as being able to feature local establishments and individuals in the community who deserved recognition, are to me, priceless! Good Karma if you will. My fun-filled and excitable posts are currently "on display". Head on over and check me and my posts out! If you look close you might just see the ghost alligator in there! And maybe a few worthy travel tips here and there.